Several species of beautiful birds have been forced into leaving the Garhi Mandu city forest area due to rise in pollution and loss of habitat. The forest area is spread over 894 acres in northeast Delhi. Locals and civic workers are dumping debris and plastic waste in a huge natural wetland, which borders as much as 60 per cent of the south and eastern boundaries of this protected forest. Regular burning of garbage is causing severe air and water pollution. On the filled up land, vegetable cultivation has also started. Water from the wetland is being regularly pumped out for cleaning vehicles and cultivation. Regular fishing is also disturbing the habitat and food chain of thes birds by causing the wetland to dry up. Open thoroughfare and playgrounds around the wetlands have also disturbed nesting. 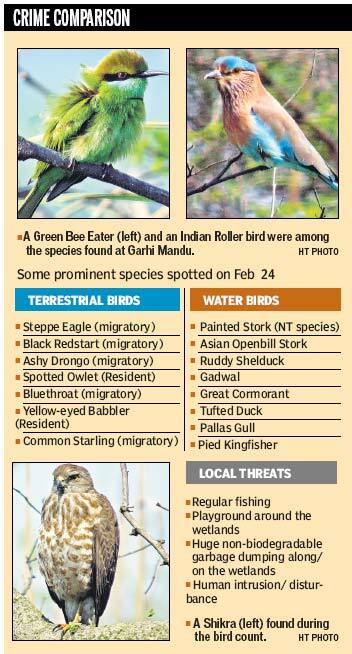 “Resident waterbirds scared away so far include oriental darter, spot-bill duck, great and little cormorant, cinnamon bittern, white-throated kingfisher, purple swamphen, Indian moorhen,” said ecologist TK Roy. Birds, whose nesting has been disturbed, include green bee-eater, bank mynah, dabchik, and blackwinged still. “The wetland attracts several species but despite repeated requests from environmentalists, the government is yet to notify the wetland. That’s why it’s unprotected and officially not part of the city forest,” he said. “While so much money is being spent to save wetlands, a natural one along this city forest has been left neglected. Once the wetland is notified by the government for its protection, Garhi Mandu City Forest will be combined forest land of terrestrial and wetland habitats,” he said. The city forest is rich in biodiversity. The first-ever bird count at Garhi Mandu, conducted on February 24 this year, found 90 species, including 26 migratory and several threatened birds. “We found 33 species of waterbirds, including 13 migratory ones. Of the 57 species of terrestrial birds, 13 were migratory,” said Roy, who conducted the count. The city forest shares its eastern boundary with colonies such as Shastri Park, Jagjit Nagar and Usmanpur along the Pushta Road which branches off National Highway 24. On the other side, it borders the left bank of the Yamuna. Green Article : Protect Mother Earth Ecological Balance. Yet for a long time, we humans have lived our lives on this planet as if we own the Earth. To make way for societal developments, we have destroyed many natural habitats to many plant and animal species. We have been carrying out deforestation and clearing of natural grasslands at alarming rates, for reasons such as to extract resources (eg. paper, tin, etc) from the earth, or simply to get more land for developments (eg. farming, building of cities, landfills). In the process, we have striped other creatures of their habitats and even lives. With the destruction of forests, we are also hindering the earth’s ability to clean itself of excessive pollutants and carbon dioxide (which contributes to global warming), resulting in a less ideal climate for both ourselves and other living organisms. To feed our increasing population, we have been stretching the earth beyond its limits, through activities such as over-farming and over-fishing. Unrelenting, we continue to seek to challenge these limits, through inventing new ways of producing more for our greedy species. We introduced the use of man-made chemical fertilizers, artificial hormonal injection in farm animals, and genetic engineering. In the process, we have introduced many man-made and harmful substances into other species, the environment and ourselves (unwittingly, we have also tainted the quality of our food supplies, and bring harm to our bodies). And many of these substances have impact still beyond our full comprehension. The ecological balance we have with other living organisms has been greatly upset. Many plant and animal species have gone extinct as a result of man’s actions. And this is even before we have even discovered their existence! The loss of the numerous plant species also mean goodbye to important sources of medicinal plants and herbs that could potentially be cures to deadly diseases plaguing mankind today. We need to be more responsible and proactive in protecting the earth’s ecological balance. This environmental consciousness should be present, whether we are dealing with government policies, or industrial and economic activities, or in our daily living. It should not be a matter of convenience, or doing whatever we can within the limits of our societal or economic constraints. In fact, considerations for the environment should come first. For without a planet to live in, there would be no room for societal or economic life. As an individual is you should not over-consume (not just food, but other goods and services as well). In addition, you should also encourage those around you to do the same. By consuming just what we need, we reduce the strain we place on the earth as a source of our resources. Keep an organic garden, or even start an organic farm, and help reintroduce more life (beyond humans and our needs) on this planet. Use organic products instead of products that release harmful chemicals into the environment. Donate regularly to forest or wildlife conservation efforts. Or better still, protect a piece of forest land under your name. Respect the lives of other living creatures (plants and animals alike, not just pet dog or cat), and also educate your kids on the importance of doing so. In this way, you would have built the foundations for a more environmentally-conscious generation. All these efforts will contribute now and in the long run to keeping this earth sustainable.